Search engine optimization isn’t rocket science. Yes, there are many variables at play, but with a concerted effort, you can rank higher than your competition in the search engines. 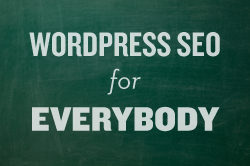 If you read Paul Suntup’s article Beginner WordPress SEO, perfect. In this article, I’m going to expand on his ideas and show you some of the fundamental on-page search engine optimization techniques that you can’t ignore. One of the best ways to let search engines know that your website is highly relevant to a specific keyword phrase is by having it in your URL. There are two ways to go about this. Depending on how many keywords you plan on targeting, this could become expensive very quickly. An alternate option is to add a subpage to your already existing domain. Note, when either of these results is shown on Google, our keywords will be in bold. Also, if you already have a URL set for an existing page, I don’t recommend you change those URLs because you may lose backlinks. Title tags are one the most important elements on your page. It’s the first chance to to tell search engines what your page is about, and search engines weight this particular tag very heavily. As a best practice, most SEOs agree that your keywords should be near the beginning of the title tag because it helps with rankings. Many times, you may make your title an exact match of your keyword. However, writing for search engines isn’t the best idea. Better to write for people, and then tweak your pages later for search engines. For this “title,” I am referring to the copy on your page. Generally, it’s a good practice to include your page title towards the top of the page. This is beneficial for your readers and search engines. Additionally, you should wrap your title in an H1 HTML tag, which Thesis does by default. I often use my exact keyword phrase as my title. While I don’t recommend writing for search engines, you can launch your article with a reader friendly article, and then go back and optimize it later. Note, be sure to keep the keywords as close to the front of the title as possible. It helps with rankings. For every image you use, there are 3 opportunities to drop in your keywords. Here is an example of what the image code should look like. <img title="atlanta wordpress designer" src="http://webdevils.biz/atlanta-wordpress-designer.jpg"
Remember, you don’t want to spam your keyword on your page, so use it sparingly. While the description doesn’t affect your search engine rankings, it’s great for increasing the click through of your existing search results. Let me explain. When your website gets listed in search engines, your description and title tag often becomes your search listing (some search engines are moving away from this, but for now, it still works). When you include your keyword in that meta data, when a searcher types in a specific keyword, if that keyword is in your meta data, it will become bolded in the search results, successfully calling more attention to your result. There are a few different kind of links. Inbound links from other websites, outbound links to other websites, and interlinks to your own website. First let’s review outbound links. Links on your page outbound to other pages looks good. To the search engines, this is like saying “I am paying my dues.” Give some link love. If you are linking out to another page that is relevant to your page and keyword phrase, it can be helpful to use your keywords in the anchor text and title=”keywords” for your outbound link. Not only will you be helping out the other web site, you will also have the keywords in your page one more time. Notice the anchor text, the actual text that is linked there, has our keywords in it. Interlinking is the act of linking to other pages inside your website. This gives you a really easy opportunity to create a strong backlink to another page in you are trying to SEO. While you certainly can and should link to other internal pages inside of your post or page content, there are other ways as well. Interlinking can also be the links to your categories in your sidebar, links to your pages in your navigation, a Similar Posts listing after your content, etc. Keep interlinking in mind when you are naming Pages, Categories, Navigation, and writing your content. When you sign up for Google Search Console and Bing Webmaster Tools, you’ll receive a lot of insight into how your website is doing in search engines. For example, you’ll find out how many times your website was shown for a specific keyword, a listing of keywords that your site ranks for, what site links you, and more. Overall, running these two tools in tandem with a stat-tracking program like Google Analytics will supply you with more data and information than you could ever dream of. By studying this data, you can see your click through rates and rankings, and then make changes accordingly. If you have taken the time to properly name your blog categories, you probably have put some effort into using certain keywords in those names. Not only that, but many of the posts in that category will most likely also include some of those keywords, so will the titles which are also links, so these pages are already highly relevant. Wouldn’t it be great if you could beef up the SEO for those category pages even more? All you have to do is, in your WordPress dashboard, go to Posts > Categories > Specific Category and you’ll see two custom sections called Introductory Headline and Introductory Content. When you add content into those two sections, and then press update, custom content will appear above that specific category page. For example, if you check out Sugarrae’s Affiliate Marketing category, you’ll see the custom content, a YouTube video, and then a listing of her affiliate marketing articles. This is great for search engine rankings because you add more content to your category pages. Plus, it’s more beneficial for people who are exploring your site. Think about it. This content helps prep your readers for the type of content they’ll find in a specific category. Thank you for reading. I hope this information helps you out and encourage you to start trying some of these techniques. Remember, you will never rank high if you never even try! About the author: Bret Phillips is a digital marketing consultant specializing in WordPress websites. Learn more at his site or contact him on twitter.